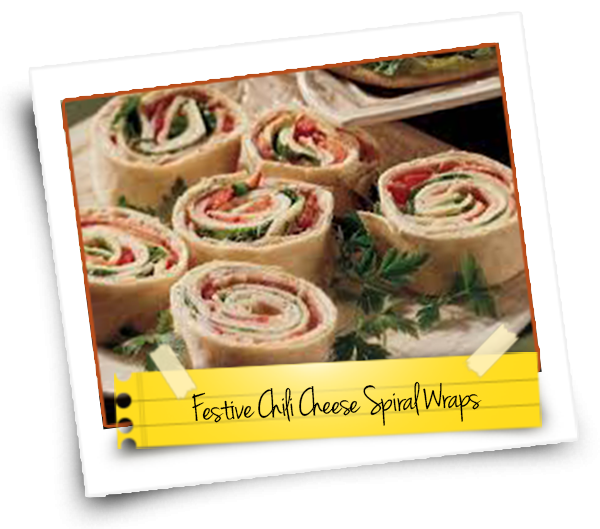 These wraps make the perfect finger food for any Christmas party. The bright red bell peppers and green spinach wraps make them festive all on their own, and arranging them in circular tiers make them the perfect base for a Christmas tree for the buffet table. Mix cheddar cheese, green onion, chiles, cream cheese, olives, and red peppers in a bowl until smooth and well combined. Split mixture into 3 portions, and spread each portion on to a tortilla. Roll tortillas up tightly being careful not to tear tortillas. Wrap all three rolls individually in tightly plastic wrap to keep all ingredients in the wrap. Chill wraps for one hour. Remove wraps from plastic wrap, place on a cutting board, and cut with a sharp knife in 3/4 in slices. Arrange wraps on a serving tray in a circular pattern, placing each success layer in a little further to create a tree shape. Cranberries, maraschino cherries, pimentos, and cheese cut with small cookie cutters can be used decorate trees.